A. 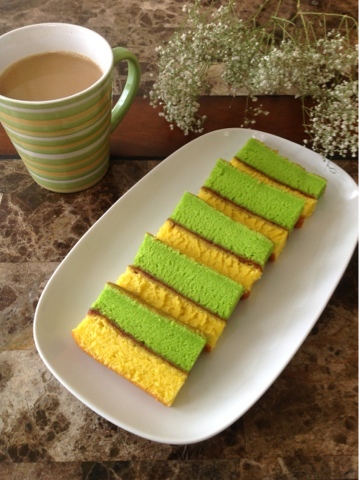 Because this isn't original lapis malang, I must admit I cheated by using my classic jelly rolled recipe :P, so I am not sure if I can call this lapis Malang or not. Prepare 2 square 8 inches pans with butter and dust it with flour, set aside. Using high speed mixer, beat egg yolk, egg white, vanilla essence and sugar until well arrised and fluffy, I'd say arround 12 minutes. It's important to have eggs in room temperature, it will raise more and faster in my opinion. Mix flour and custard powder, turn the mixer to the lowest speed. Gradually add melted butter and mixed flour. Continue folding the batter with spatulla. Add pandan essence into another part, and folded well. Pour it into another prepared cake pan. Bake it for 12 minutes, turn. The oven down to 375F and continue baking for another 10 minutes. When it's done, smear strowberry jam evenly on the frist cake surface, release another cake and place it on top of jam smeared cake. Put the pan on top of the cake to make sure the two cakes are attached and well glued. I made some pineapple jam some times ago, and I haven't had any chance to blog about it. Pineapple jam is so popular among Indonesian, matter of fact in every big celebration such as Eid ul Fitr or Xmas people make pineapple cookies. So I can almost guarantee most of them know how to make pineapple jam. It's very easy to make, you don't need to measure anything, it only calls for 2 ingredients .. pineapple and sugar that's all! you don't need to use pectin. Heat the pineapple with sugar in a non coated pan in medium low heat, continually stir the mixture until reaching jam consistency you desired. If making this for regular everyday jam, I like using blender so the end result would be really smooth. But if you make it for pineapple cookies, I'd recommend using regular manual cheese shredder, and cook it until really thick. Last night I made this quinoa salad for my family, I honestly did not think that they gonna love it, but I was wrong. I love preparing this simple dish that contains everything, so easy and quick to prepare. Mixed the marinating ingredients and marinade the chicken for couple hours. In the mean time, heat the olive oil and saute garlic and onion until fragrant. I know normally quinoa salad has raw red onion, but my family aren't too crazy about raw onion, so I used regular onion instead and saute-ing it together with garlic, I love caramelized onion flavor and I think it gives and bring the salad flavor to another level. Next I add bell peppers, wait till it gets wilted (or cooked) I love it a bit crunchy so I did not cook it for too long, then throw in baby zucchini, heirloom tomatoes, salt and pepper. Remove from the heat, add in the prepared quinoa and baby spinach then sprinkle with lemon juice, toss it couple times and transfer to serving dish. Garnish it with fresh basil and topped with sliced grilled chicken. Enjoy!! Yorkshire pudding or here in America is called Pop Overs is my hubby's family tradition whenever they have special feast dinner like Thanksgiving. It's a must side dish to have, and I am so glad to get the recipe. I found out that making pop overs is so easy if you know the trick, and most of the ingredients uses are available in your pantry and refrigerator. I have shared this recipe with some of my friends and they love it, some even modified it by adding green onion. Prepare the muffin pan, fill each cups/cavities with 1 tsp of cooking oil, and heat it in the oven. In the mean time, whisk the eggs and milk until well mixed, then gradually add flour and salt and keep whisking until the batter texture is silky smooth. Make sure there are no more clumps in the batter. You can use blender to do the job, but I love using just regular whisk. Make sure the oil inside the muffin cup are really hot, but not burnt. This is the most important step that you have to pay attention to, if the oil is not hot enough the pop overs wont be rise. Bake it until rise and brown, about 25 to 30 minutes. We enjoy this with some gravy for dinner, but if there are some leftover, I can heat it up then fill it with some jam for breakfast. My kids love love love this side dish, it's so obvious because of the sweetness and the color is so interesting. I was so happy to got tri-colored carrots, it's not available all the time here in Bellingham. You can use baby carrots if you could not find tri-colored carrots. Anyway, the cooking method is similar to Green Beans Amandine, in term of blanching the vegetable, so you can prepared this process ahead of time, put it in the refrigerator and ready to toasted in honey glaze the next day. 1/4 cup of flat leave parsley, chopped. Add the remain ingredients, stir again to make sure every carrot is coated by honey glaze. Remove from the heat and ready to serve. Enjoy! This is definitely my favorite thanksgiving side dishes, it's very simple to make yet very tasty. I love the toasted almond in it, it gives a nutty flavor... Love it love it!! I use the recipe from this website, did not reduce or add anything at all, it's just perfect as it is!! Bring a 6- to 7-quart pot of water to a boil. Add the beans and cook until bright green and barely crisp-tender, about 2 minutes. Drain in a colander and rinse under cold running water until completely cool. Spread the beans on a clean kitchen towel and dry thoroughly. In a 12-inch skillet, heat the butter and oil over medium-low heat until the butter melts and the foam subsides. Add the almonds and cook, stirring occasionally, until golden-brown all over, about 3 minutes. Using a slotted spoon, transfer the almonds to a plate. Reduce the heat to low and add the garlic to the skillet. Cook, stirring constantly, until fragrant, about 30 seconds. Add the beans, increase the heat to medium, and cook, tossing occasionally, until crisp-tender and lightly browned in some places, 5 to 8 minutes. Stir in the lemon juice and season to taste with salt and pepper. Transfer to a serving platter, sprinkle with the almonds, and serve. The beans can be blanched (boiled until barely crisp-tender) up to 1 day ahead; refrigerate wrapped in paper towels in a plastic bag. I use basic chocolate chip recipe for this cookies, but I did a little twist to it by accident. I was actually lanned to make strawberry covered chocolate for thanksgiving dinner dessert, but my youngest son keep eating the strawberry and left only its stem on the table, and I already melted some chocolate. Mix the flour, baking soda, baking powder and salt, set aside. In a separated bowl, xix the sugar, butter and vanilla and turn the mixer on medium high, then gradually add eggs one at a time. Bake it until done for about 10 - 12 minutes, more if you wanted the cookies to be crispy. Let it cool in a wire rack, then drizzle with melted chocolate on top.